How Do I Delete Unwanted/Useless Data from My iPhone? This is the data age and everyone, most times, has little or no control over the amount of data that come into their mobile device. In the case of an iPhone user, the data can quickly pile up. Of course, most data on your iPhone are preset, but some others are those you have stored up for later use. When iPhone storage space is full and the device begins to run low, how do i delete data from my iPhone? You may also want to store new information, and you could discover that new ones better replace some data. That is just when you should consider deleting your iPhone data. 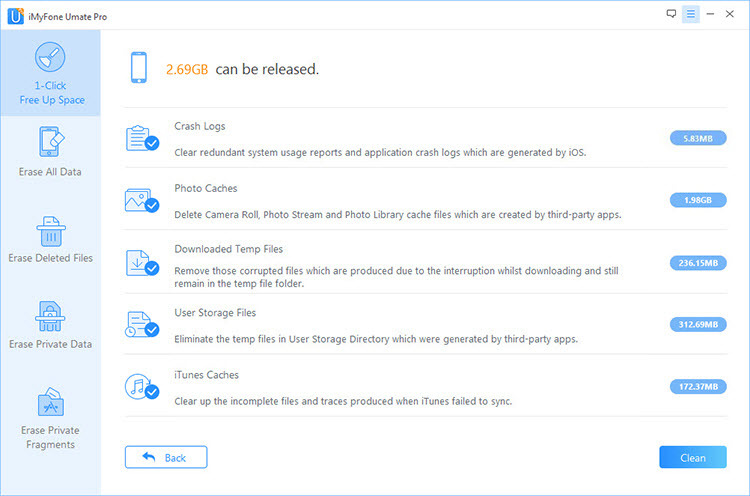 Junks files like app caches, cookies, crash logs, and the like can pile up overnight on your iPhone. They are responsible for the slow function of iPhone. Still wonder how do i delete data from my iPhone? First of all, you need to clear all these junks. You may want to use a normal method; however, it will not clear the hidden ones. iMyFone Umate Pro or iMyFone Umate Pro for Mac can delete junks, cookies, caches and others for FREE. Using Umate Pro is highly recommended for deleting data from iPhone because your iPhone app "Document and Data" will be cleared. Also, the iTunes "other" storage will be cleared too. Deleting data from iPhone can be done in several ways, but the manual method is the most commonly used one. Manually deleting data from iPhone is not a rocket science and you can follow the steps below to do that. From your iPhone, click on Settings. Click on Storage & Backup. From the menu, click Manage Storage. Check under Documents & Data and on each app. On your top left, click Edit. Finally, click Delete All to remove all documents. The above steps can help to delete your iPhone data as well as apps, text, and media files. However, this process cannot permanently delete the data from iPhone. Why is that so? Well, first, deleting data using the above steps cannot help you spot every data that you want to delete, and you might find your device still clogged with junks. Even if you manage to delete some data, they can easily be retrieved. There are recovery tools that can restore all those unwanted data, and they could be a potent tool in the hand of an unscrupulous person intent on accessing your private information. The fact that the above manual steps cannot permanently delete iPhone data calls for the use of powerful software to do the job. 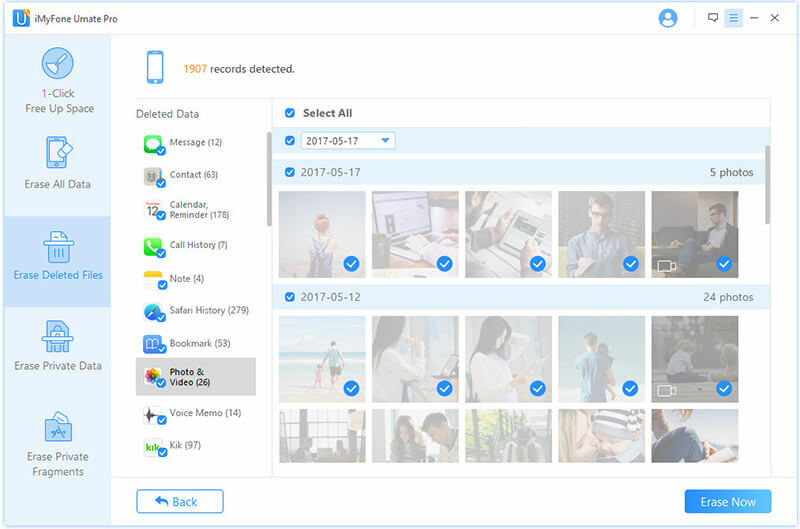 The only reliable software you can use that will ensure that not only will those data be deleted, but will also permanently delete them is iMyFone Umate Pro. Umate Pro is renowned for its ability to effectively and permanently delete data from iPhone. No one wants to be caught unaware by intruders or wants anyone to access private data. Thus, it is important to use software that prevents anyone from retrieving vital information not meant for a third party. 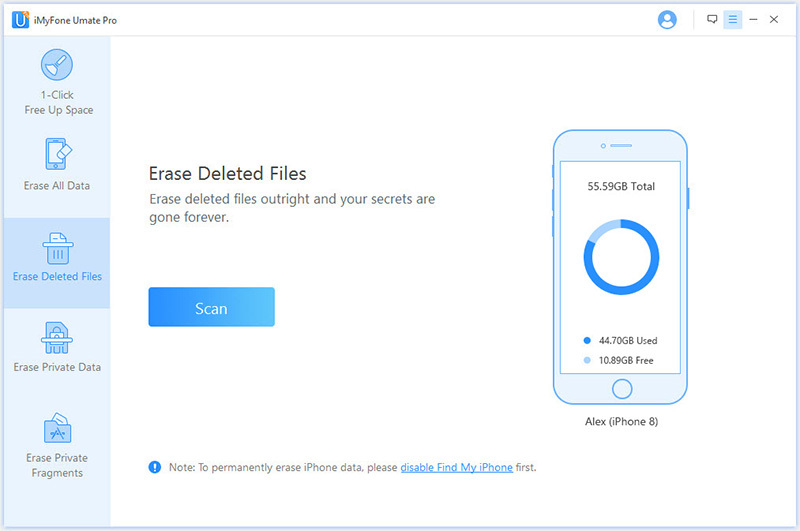 Follow these systematic step-guides to permanently erase your iPhone data. Step 1: Run Umate Pro after downloading and installing it, and connect your iOS device via a cable. Step 2: Select a erase mode from the provided options, then Scan your iOS device for a full data analysis. Step 3: Click on "Erase Now" button to erase data from your iPhone/iPad/iPod Touch. There are various erase modes that you can select from when you want to permanently erase a particular information or data. What about those already deleted files? You might have thought that you have completely deleted them and that no one can gain access to some data that were very sensitive. Alas, you might be mistaken. Why? Well, if you type into your search bar for recovery tools, you will find a host of them. These tools can be used to restore or retrieve your deleted files. If your device got into the wrong hand, you will be instantly exposed. Your privacy can be broken into with any of these recovery tools. Now, the best you can do is to use Umate Pro, a powerful tool, to get rid of your deleted files painlessly and permanently. Umate Pro erase deleted files with no chance of recovery. Other areas that need your attention are WhatsApp and some places holding your private data. It is imperative that you use Umate Pro to clear them up and prevent unauthorized access to your private data. If you were to delete with just the usual method, you could hurt your privacy. Therefore, Umate Pro is a tool you should surely have for your own benefit. Permanently erase private iOS data: WhatsApp messages & attachments, messages, call histories, photos, videos etc. 1-click to clear up and boost up your iPhone/iPad/iPod Touch, as well as optimize iOS performance.